No additional charge for guests up to maximum occupancy. Reservations canceled any time after the booking date are subject to a 100% penalty. No refunds will be allowed. Guest is responsible for the entire stay and forfeits all payments. Luxe RV offers glampers the opportunity to take their ultra luxury RVs on the road anywhere from California. Take a trip to Arizona or Nevada and back to the Beverly Hills. Visit popular locations and camp close to nature without sacrificing comfort. Guests can be picked up from the LAX airport with prior notification. The Mercedes-Benz 3500 Sprinter Chassis is the perfect fit for the 2015 Serenity by Leisure Travel Vans. And, ita has a 3L V6 BlueTEC diesel engine under the hood, with class leading fuel economy estimated at 16–22 MPG. There is astonishing space, storage and versatility. 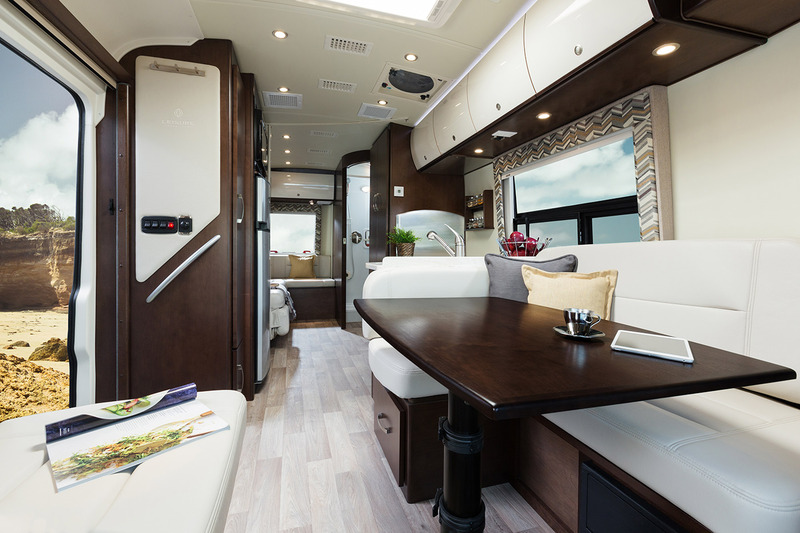 From the spacious galley with two pullout pantries to the enclosed fiberglass shower, each and every corner of the Serenity has been cleverly utilized; it feels so roomy, you won’t believe you’re in a 24-foot motorhome! These type of RVs don't require any special license and can sleep up to four people. Exterior Storage Capacity is 40 cubic feet. more locations to come . . . This luxury RV requires a Class C license only. You can park it almost anywhere, unlike Class A RVs that can only be parked on special RV packs. You can provide your own insurance or request some. We apologize for the inconvenience, but our quotation system is temporarily disabled with this property and we hope to have this remedied shortly. Please check back in with us in 24 hours. Again, we apologize for the inconvenience. Please choose a departure date after your arrival date. Your email has been sent. Thanks for sharing!